The bright stars in the sky can be informally linked to form fun shapes called asterisms. Asterisms can use all of a constellation (Little Dipper), part of a constellation (Big Dipper), or draw from multiple constellations, such as the Winter Football asterism. The SkySafari 6 app has an option to highlight selected asterisms using orange lines and labels. One of the big news stories nationally over the past few weeks has been the invasion of the polar vortex in the northern tier of the United States. It swept a brutally frigid surge of air in from the polar regions. This, in turn, dropped temperatures to record or near-record levels from the Plains states through the Midwest and on into New England. For stargazers, cold winter nights (including before the vortex) made for some tough decisions. Recall that there was a spectacular total eclipse of the moon on the night of Jan. 20. Many locations were blessed with clear skies, but because of potentially dangerous windchills, some space fans passed on watching this great show. But bundling up to see the winter sky is well worth the wait. In a moment, I'll offer some suggestions on how to best handle the cold when skygazing. But first, here are some specifics on why cold nights in January and February appear so much clearer compared to those balmy nights in July and August. We're now at midwinter; in fact, the halfway point of the season came at 5:10 a.m. EST (1010 GMT) this past Monday (Feb. 4). Night skies now seem especially transparent. One reason for the clarity of a winter's night is that cold air cannot hold as much moisture as warm air can. Hence, on many nights in the summer, the warm, moisture-laden atmosphere makes the sky appear hazier. By day, the summer sky is a milky, washed-out blue, which in winter, becomes a richer, deeper and darker shade of blue. For us in northern climes, this only adds more luster to that part of the sky containing the beautiful wintertime constellations. 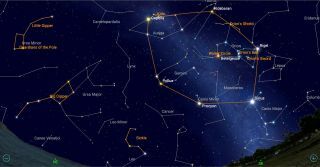 Step outside around 9 p.m. this month, and you'll see Orion, the hunter, along with Taurus, the bull to Orion's upper right. To the hunter's lower left, you'll see his faithful companion, Canis Major, the big dog. A line extended diagonally in either direction through Orion's belt will take you to the brightest star in Taurus, the orange-hued Aldebaran, and the brightest of all stars, bluish-white Sirius. There are also some beautiful deep-sky objects to gaze at, such the V-shaped Hyades star cluster, which marks the face of Taurus, and the Pleiades cluster, popularly known as "the Seven Sisters." Just below the Belt of Orion is the Great Nebula, a superb sight in telescopes. It's a vast cloud of extremely tenuous glowing gas and dust located approximately 1,600 light-years away from Earth and stretching about 30 light-years across (or more than 20,000 times the diameter of our entire solar system). Astrophysicists now believe that this nebulous stuff is a stellar incubator, the primeval chaos in which star formation is presently occurring. If you have a telescope, especially a large one, a very cold night might make you think twice about bringing the instrument outside. Just trying to properly set it up in such conditions can be problematic. And yet, you can still get a nice view of the sights I just described if you use a pair of good binoculars. No time-consuming setup necessary; just step outside and aim toward your cosmic quarry. In fact, for manyskywatching situations, binoculars are the best instrument to use. They are lightweight and portable, and quality binoculars can far outrank a poor-quality, small telescope. Also, they should last you a lifetime. Beginners usually are pleasantly surprised the first time they sweep the night sky with binoculars, and advanced amateurs and professionals alike regard the instruments as standard viewing equipment. If you plan to be outside for long on these frosty nights, remember that enjoying that starry winter sky requires protection against low temperatures. This was a bitter lesson that the very first director of New York's Hayden Planetarium, Clyde Fisher, learned one night in 1931, when he and noted meteor expert Charles Olivier journeyed to the Catskill Mountains to view some meteors. It was on a mid-November night when "the air bit shrewdly," yet Fisher wore silk socks and an overcoat, and was soon doing a tap dance to keep his feet from freezing. In contrast, Olivier dressed like he was going to Alaska. But even Olivier was probably overdressed, to the point that it might have been difficult to move around. You can properly protect yourself against the elements without suiting up like an astronaut about to walk on the moon. One of the best garments I have found for winter skywatching is a hooded ski parka, which is lightweight yet provides excellent insulation. I also like ski pants, which are superior to ordinary denims or corduroys. Of course, you should also invest in a good pair of gloves that are specially designed for intense cold. If you plan to stay outside for longer than, say, a half-hour, consider bringing along a thermos filled with something hot, like coffee, tea or cocoa. And as Fisher would certainly advise, remember your feet! While two pairs of warm socks in loose-fitting shoes are often adequate, for protracted observing on bitter-cold nights, it is even better if you wear insulated boots — even if there isn't any snow or ice on the ground. So, clear, starry skies to all ... and remember to stay warm!